I used to head to this address when I had a cold. There was a certain special something in a bowl of Jo Moon Ting congee that went to work on sore throats and self pity. And while I was there, I’d pick up a roast duck or slab of barbecued pork from the line of burnished meat hanging in Jo Moon’s street side window. But enough with the history lesson. 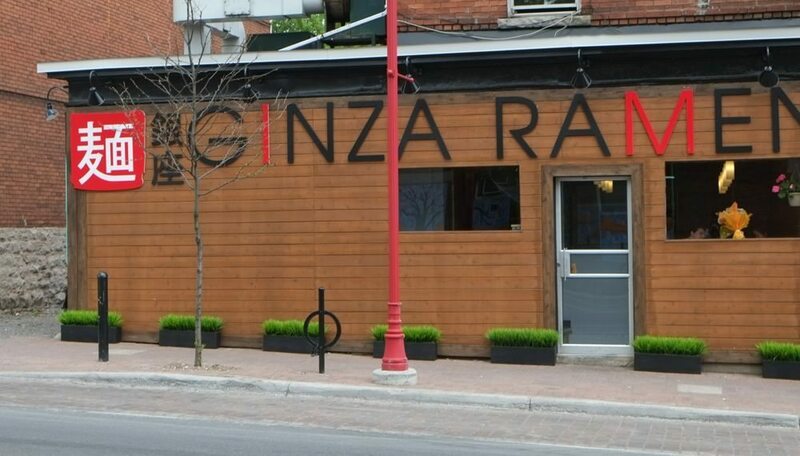 The Kings have gone now, and as of about a month ago, 832 Somerset St. is the new home of a second location for an Elgin Street restaurant called Ginza Ramen. 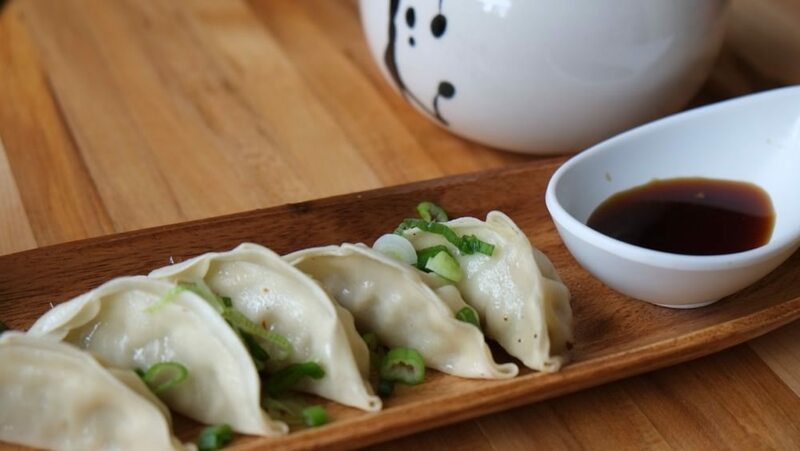 Its downtown big brother sells more things — sushi, vermicelli dishes, pho, and a longer list of appetizers — and it has a liquor license, which is ‘in the works’ at this location. 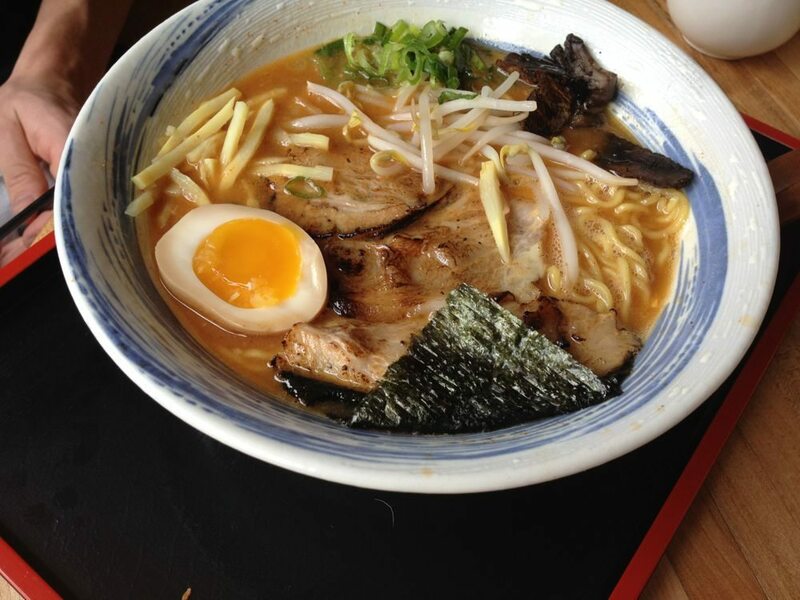 But the Chinatown location’s focus is more on ramen. There are six varieties here — three based on pork broth, two on chicken, and one vegetarian broth that’s miso-based and a bit grainier. They were out of chicken broth — which seemed odd given it was early evening — so we ordered a spicy Tonkotsu Ramen (with enough pow of chili heat to make upper lips sweat) and the vegetable ramen. Their presentation reminded me a bit of the Korean bibimbap, with quadrants of colour and texture that you gaze upon for a moment before plunging in chopsticks and mucking up the pretty surface. But you want to get at it before the soft boiled soy-marinated egg has over-cooked in the heat of the plunge. You want the molten yolk still to be free to run into the liquid, enriching the broth. Other than egg and the chewy strings of ramen noodle (not made in house, but fresh tasting) you find bamboo shoots, shiitake mushrooms, scallion, nori, and thin shavings of crisp and fatty pork belly. The miso soup adds corn, bean sprouts, and bok choy. Based on our server’s suggestion, we tossed in some of the pickled ginger from the pot on the wooden table. I recognize a well made broth — one that begins life with bones in a pot and spends ages burbling away — and I don’t dispute its merits, but if you’re used to the sweet, fragrant pho (Vietnamese beef noodle soup) you will find this broth cloudier, richer, less sweet and certainly more piggy. The noodles used are the Japanese wheat noodles, rather than the rice vermicelli of pho. The flavour of the broth starts off heavy, and for me, a bit off-putting. But the flavour grows, the garlic hits, the richness lightens, and the porkiness becomes more pleasant. Other than soup, there are a few snacks at Ginza Ramen: gyoza (best of the bunch), chicken karaage, and deep fried squid legs wrapped in the same crunchy, golden coat, and furnished with a wasabi mayonnaise. All are tasty enough but none memorable or, I would suggest, made in house. There’s also two fried rice dishes, neither of which we tried. But if your only encounter with ramen has been in a dorm room with a kettle, a Mr. Noodles package and its glittering silver ‘flavour pouch’ you might want to get yourself to Ginza and see what all the fuss is about. In a post-Momofuku noodle-mad era, much has been made about the ramen rage, and Ottawa looks to be getting a taste of that, with Ginza locations leading the charge.